A timber supported overlay roof is a roof that is made up of timber rafters, the glazing is then supported by these rafters and sealed on the top using rafter glazing bars usually made of aluminium but sometimes plastic. Often these types of structures can be given a new lease of life without changing the whole structure. We can change just the glazing panels and the rafter glazing bars making it a cheaper option all round and without the need to remove the whole roof. Both glass and polycarbonate can be used on these roofs. All this coupled with new guttering and maybe a new coat of paint can make your roof like new again. Conservatory roof repairs will help bring your conservatory back to its best. 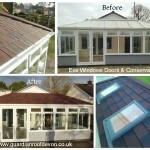 Did you know you can replace just your conservatory roof! ?